Istanbul Bosphorus was a mini waterway where ancient Black Sea waters run to the Aeagean Sea and Mediterranean Sea. Until 12.500 BC, when the Ice Age was over, Black Sea was a freshwater lake. 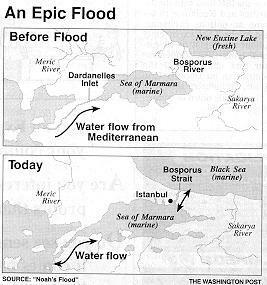 From the times when Northern Glaciers started to melt, in Late Neolithic Period, (5700-5600 BC) right after the rise of the sea levels, this mini waterway in Istanbul Bosphorus started to run its way in just to opposite direction: It started to run to Black Sea from Aeagean Sea and Mediterranean Sea. The two-way current as up and down in the Istanbul Bosphorus and The Dardanelles (Canakkale) emerged from these geological events. Today’s Istanbul Bosphorus region, where it is proved that there are shale and brownstone and micro- fossils that are younger than 7500 years in deep sediments; and freshwater and salty water join, which makes Black sea and open sea by running to it from the Sea of Marmara. As a result of the rises of the waters around it, the expanding of the Black Sea Lake should be thought archaeologically that the works of some communities like Proto-Indian Europeans, Striped Ceramicist, Vincas, Hamangians and Danilo Hvar, and they left to Europe after an geological evolvement that will make the mountains move into the sea perpendicularly. The mountains in the sea in Black Sea makes it difficult to swim here and the bad temper of the sea can be said as the rebel of the water because it was a closed lake in the ancient times. The stories that say Neolithic ruins that are defined as ancient have been found during the building of the subway station in Istanbul Bosphorus are always on the news. 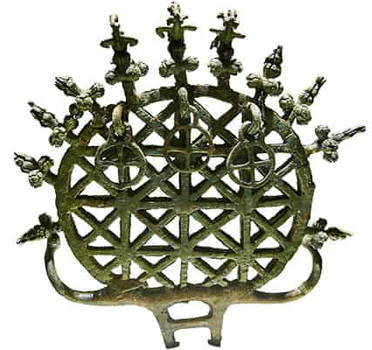 These archaeological discovers should be done in accordance with the things said above. This link below talks about the same opinions about the topic. All in all, we can say that the news on the link may be evaluated as a new archaeological finding, but the relationship between the Istanbul Bosphorus and the Neolithic Period should be considered archaeologically in the scope of the explanations above.